The Wisconsin Department of Transportation (WisDOT), in collaboration with local law enforcement representatives and other stakeholders, has embarked on an agency wide initiative to improve crash data collection and safety analysis capabilities by updating the existing Wisconsin MV4000 crash report form. The redesigned form will be rolled out on January 1, 2017 and will serve as the basis for a new crash database management system that will be deployed at the same time. Several important changes will accompany the rollout of the new crash report form including a requirement for all law enforcement agencies to submit crash reports electronically through the Wisconsin Badger TraCS system and an internal WisDOT reorganization that will transfer stewardship of the crash data from the Division of Motor Vehicles to the Division of State Patrol. This article provides a summary of important information about the crash report redesign and what it means for analysts and other end users of Wisconsin crash data. A new crash report form (MV4000) and a new crash database will be developed to more fully capture the conditions at the crash scene. The new form and database will be developed using national standards from US DOT (http://www.mmucc.us) to improve safety from a national perspective. Additionally, the new form will allow for more direct safety comparisons from state to state. The Badger TraCS online help manual and training will be updated to ease the transition by law enforcement to the new crash report form. The new form will include several new fields, including 77 at the crash level, 36 at the vehicle level, and 35 at the person level. At the same time 14 existing fields will be deleted from the crash level, and four will be deleted from the vehicle level. Additionally, at the crash level 11 fields will have additions to the existing fields, 15 existing fields will have additions at the vehicle level, and 18 fields will have additions at the person level. An example of an existing field with additional choices being added is the location of a pedestrian at a crash. On the existing form there are 5 choices for an officer at the scene of a crash to select. The new MV4000 will include 15 choices. A comparison is shown below. The updates to the MV4000 and crash database will be used to improve safety on Wisconsin roadways. Currently, $12 million is granted to law enforcement to improve safety on the roads. Crash history is also a critical input for state and local safety engineering project planning and is an increasingly important requirement for MAP 21 performance measures. With more complete information about traffic crashes and a more complete crash database, unsafe roadways can be more easily and accurately identified, and the problems can be rectified with the ultimate goal of achieving zero deaths on Wisconsin roadways: Zero In Wisconsin. EMS Run Number: The EMS run number is an important addition to the newly revised MV4000 because it allows for easier linkage between the crash information completed by the law enforcement officers on the MV4000, and hospital data from medical practitioners. The hospital data contains the health outcome of the patient and can provide more accurate and complete understanding of injury severity and the costs of traffic crashes. What are the problems and how to address? 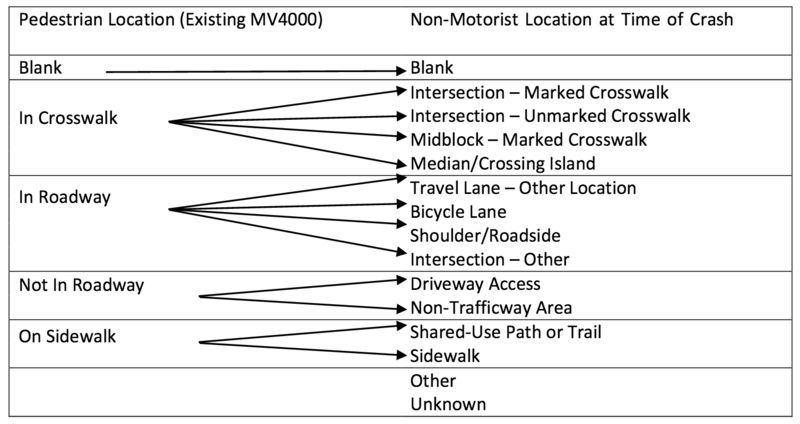 The current MV4000 crash report form does not contain specific fields for some common crash characteristics that would be beneficial to improving the safety of roadways in Wisconsin. Some of these characteristics not specifically on the current MV4000 include guardrail crashes, roundabout crashes, and cell phone use during a crash. Currently to determine whether one of these attributes is involved in a crash, report forms need to be evaluated carefully and thoroughly, specifically the narrative written by the officer at the scene of the crash. The newly designed MV4000 and crash database will contain additional fields and choices for an officer to select from. These new fields will make a more complete picture of the crash scene, both from the roadway characteristics (if a guardrail was involved, if the crash was at a roundabout) and from a human factors perspective (what the crash victims were doing at the time of the crash/ what caused the crash). The addition of guardrails, and more intersection control choices (roundabouts, signals, stop signs) allows for safety analyses to be completed more easily, and ensures that all crashes, or crash types, at a particular location are accounted for. Additionally, several fields were slightly changed to add more information allowing for a more complete picture of what happened before the crash (such as where the driver was located on the roadway and whether they were distracted, intoxicated, etc. ), during the crash (such as the manner of collision, and the belt usage or safety equipment used by the crash victim, if any) , and a more complete picture of what happened to the crash victim(s) after a crash occurred (such as their injury severity, the EMS run number, and health outcomes assessed by medical practitioners). What are the potential impacts to existing analysis processes? The new crash report form and database will provide more complete and descriptive information about the crash scene, but will also introduce several challenges for existing processes. Applications that incorporate crash data from the Wisconsin Department of Transportation and/or the Traffic Operations and Safety (TOPS) Laboratory will need to be modified to accommodate the new set of elements. In addition, multiyear analyses that span the new and old forms will need to account for changes to crash report form field definitions and field choices. WisDOT will provide guidance on how to best align new and old data elements with the rollout of the new crash report form. What it’s not? The new crash report form and database were created for a more complete understanding of every crash to benefit the safety of the roadway, and highway users, i.e. safety equipment used or not used by motorcyclists, pedestrians, and vehicle occupants involved in a crash. The new form is not created for insurance purposes. Text and information from ITE Wisconsin Newsletter and Wisconsin Traffic Safety Reporter. For questions with regards to the roll out of the new crash report form, please contact: Crash.database@dot.wi.gov. For questions with regards to the new crash database, please contact bill@wisc.edu.